Add one more to today’s list of resources for fundraisers! 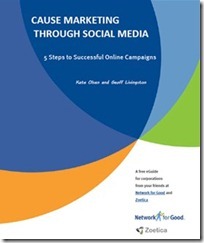 Just released by Network for Good and Zoetica, here's a new free eGuide on Cause Marketing Through Social Media: 5 Steps to Successful Online Campaigns. The report is aimed at companies – the other half of the cause marketing equation – but holds lots of value for non-profit organizations who may be considering a partnership with business for a fundraising campaign. To learn more, to check out the handy “Online Social Good Campaign Checklist” that is included with this eGuide, and to download your free copy of Cause Marketing Through Social Media: 5 Steps to Successful Online Campaigns, visit www.networkforgood.org/causemarketing.